This is a proposal for an emergency exit for residents of West Bragg Creek and Wintergreen in response to a disaster like a flood or wildfire when the bridge is unreliable. In the 2005 flood the bridge over the Elbow River on Balsam Avenue was briefly closed as it was considered unreliable. At that point there was no way into or out of West Bragg and Wintergreen. Again in 2013 the bridge was closed but this time for 2 1/2 days. Some folks were shut out and some shut in. I’m not aware of anyone who experienced a life threatening trauma, but it could easily happen. I know, from personal experience, that it caused some anxiety as we had no good communications links and it was difficult, if not impossible to know what was happening. In the event of a wildfire this kind of trauma would have been life-threatening. It’s unlikely, but conceivable that a First Nations warrior group could blockade Highway 22 on Native land. An alternate route might be pressed into service in a variety of crisis scenarios – fire, flood, blockade, road accident or any number of other catastrophic events. For some reason nothing was done after the 2005 flood. We can’t let this happen again. Some folks have proposed a second bridge, but I don’t see that as a fail-safe solution. The solution that works for me is a road exit that travels overland to Highway 22. Two proposals are shown in the map at left. One travels along the Tsuut’ina boundary. I’ll check to see if there is a right-of-way along the border. The other travels exclusively on private land, mostly Copithorne. Part of the road is already developed. It exits on Highway 22 near the Volker-Stevin garage. This one doesn’t cross the river. The arguments against the road come down to economics and inconvenience. Property owners don’t want increased traffic past their homes and in particular don’t want to create a loop that sightseers might use to travel through West Bragg Creek. Although there would be significant time-saving and convenience for Wintergreen residents to use this route to get to the city, it would be possible to put a locked gate that would only open in the event of an emergency. The road should be a county road. I suspect that there are right-of-ways along the border with the Tsuut’ina. 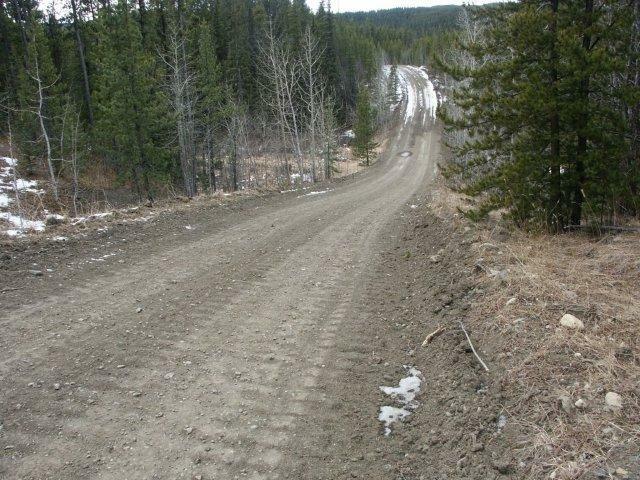 Industry builds many kilometres of roads to access the resources in Kananaskis. A dirt road of this type would be quite adequate. If no right-of way exists, the county would have to negotiate with the band or with property owners – either one would likely be a problem. The alternate route to the north uses private land exclusively. There are roads and tracks along much of the way. Rumour has it that someone used this route to escape during the flood of 2013 when the bridge was closed. The route begins at the “Sugar Shack” on Range Road 52 which quickly turns into a private road. That connects to another private road that runs west to east and hooks up with Mountain Lion Dr. in Wintergreen. 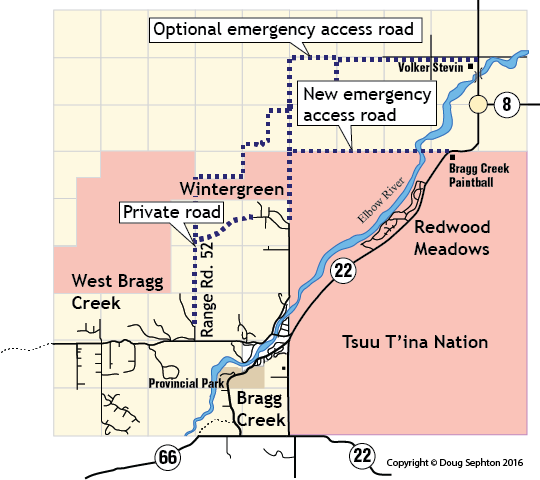 A new road, something like one of the access roads for the energy industry or loggers in Kananaskis would be built north from Wintergreen to the north-west border of the Tsuut’ina Nation and then it would follow that border east to meet Highway 22 near the paintball site. The alternate route would use the road that ends at the Our Lady of Peace cairn. That road exits near the Volker-Stevin garage on Highway 22. There are lots of problems to be solved along the way, but the bottom line is, do we have to put our lives at risk to avoid dealing with this. We need a solution now.